It’s my second day in the north-western environs of central Bangkok, up against the river just north of the royal neighbourhood. I had a masochistic urge to wander down Khao San Road for the first time in twenty years, and decided to walk, take in some sights and smells – the two are always inextricably linked in Bangkok, I think. Alright. Let’s just hold on a second. I slip back into my room to take a look. What could be so exciting? It’s just a street ma….Oh. Nancy Chandler. Sounds like a woman you should be meeting for Martinis at the beginning of a noir detective film. 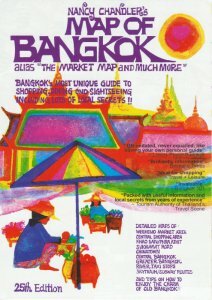 As an American artist living in Bangkok in 1974, she first produced a map as a guide to the local markets for the American Women’s Club. Her style is funky, colourful and kitsch, in all the best senses of those words. But it’s the detail, the pithy commentary and the layout that set it apart. Illustrations of buildings and landmarks make it easy to get your bearings. Personal recommendations (“Great live band here!”) make it feel like she’s taking you around. Neighbourhoods are clearly delineated and the map just makes the city jump out at you, poking you cheekily instead of the weary, utilitarian resignation of most map designs. Box outs are invaluable – How to Enjoy the Charm of Old Bangkok, Scams to Avoid, Public Transport Tips. And of course the market information is second to none. The maps are updates and produced in conjunction with Nancy’s daughter, Nima, who adds her own modern tastes to the highlighted attractions. It’s a small thing of beauty, an obviously joyous enterprise, and the enthusiasm exudes even just from the design and layout. 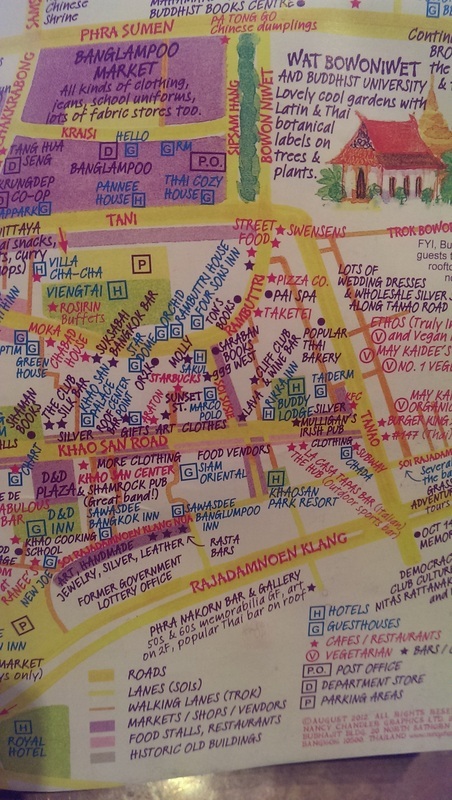 I walk south, smiling as Nancy points out various piers (“Fish feeding here!”) and stalls (“Fresh meat and veggies”), and point her in the direction of Bang Lampoo neighbourhood and the Khao San Road, which I don’t expect to uphold the elegance and delight of my map. 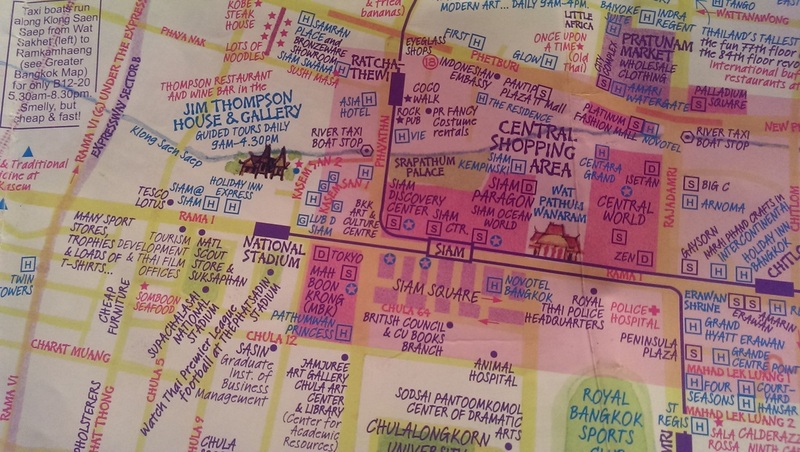 Maybe in a couple of decades, the maps will have the interactive smell experience of Bangkok. Until then, ditch the Google Maps and pick up this analogue triumph. Find out more and buy maps at Nancy Chandler's Website.